30 in Graphtec FC8600-75 Vinyl Cutter & Stand. 1 - 30 in Graphtec FC8600-75 Vinyl Cutter & Stand. 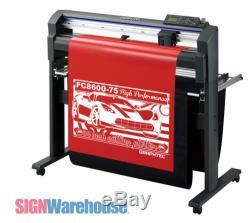 Graphtec FC8600-75 Vinyl Cutter Specifications. Digital Servo Friction feed with MicroGrit roll drive. 30.0 in x 164ft. 2.0 in x 36.2 in. Maximum auto cross cutting width. Auto sheet cutter maximum thickness. 11 mil including release liner. 58.5 in/s (1485 mm/s) diagonal. 4.0 G (39.2 m/s2) 5.7 diagonal. 20 g to 600 g (0.2 N to 5.88 N) in 48 steps. 0.0002 in (0.005 mm); Minimum Character Size 2 0.125in alphanumeric Helvetica Medium Font. 01mm, HP-GL: 0.001 in (0.025 mm): GPGL: 254, 508, 1016, 2540: HPGL1016. 0.0039 in / 80 in (0.1 mm / 2 m) travel or better. Accepts one tool at a time. Cutting blade, plotting pen, pouncing tool, second penholder (optional). Tungsten Carbide (0.9 mm or 1.5 mm). Water-based fiber tip, oil-based ballpoint, light pointer (for proofing). Self-adhesive vinyl film, window tint film, paint protection film, etc. RS-232C serial, USB2.0 (USB 1.1 compatible), Ethernet 10Base-T/100Base - E-TX (optional). GP-GL / HP-GL (auto selecting). 3 in Graphic LCD with comprehensive icon-corresponding soft keys. English,ish, Portuguese, Japanese, German, French, Italian. Standard Registration Mark Sensor for automated contour/die-cutting of pre-printed images. Brake system assist for enhanced media alignment; Media Guide lines. Standard built-in SmartFeed function automatically unwinds and pre-feeds media for an operator-specified distance upon self-recognition of plot file length. 100-240 VAC, 50/60 Hz, auto switching, 120 VA max. CE mark, FCC, VCCI, cUL, UL, RoHS. Media Catch basket, Media bracket. CuttingMaster2 plug-in software to CorelDraw and Adobe Illustrator (Windows and Mac compatible), Cutting Plotter Controller software (Windows only). (1) PHP 32-CB09NHS Blade Holder; (1) CB09UA-1 Blade; (1) KF550 Black (water-based fiber top pen). 3 year parts & labor. 22 lbs; 34.6 in x 10.2 in x 8.9 in. 92.6 lbs; 58.2 in x 17.8 in x 24.1 in. Graphtec FC8600 Vinyl Cutter Packages. These packages add even more value to this cutter! You get Vinyl Express LXi Expert, from SAI, the makers of FlexiSIGN - and a supply starter kit. Dont be fooled by any other software! Vinyl Express LXi software is one of the most-popular brands of sign-making software in the world and sells for hundreds. LXi Expert is a complete text layout and design program that utilizes both Windows TrueType and Adobe Type 1 fonts. LXi allows you to do simultaneous cutting and text editing. And you can import existing. It's upgradeable to Master and Master Plus versions when you need more design features. This is a cost-effective software solution for vinyl cutters just starting out that can grow with your needs. Graphtec FC8600 Series: High-Performance, Roll-Feed Cutting Plotter. The cutting plotter that sets an industry standard for throughput, quality and durability is now an even more powerful tool for sign makers, graphic artists, auto-aftermarket professionals, countertop installers or anyone in search of the highest-quality and most technically-advanced cutter on the market. The newly designed FC8600 has many new features, including a 3-inch wide LCD Control Panel, a Dual User Configuration function, optional Ethernet capability and an enhanced ARMS contour-cutting system that automatically detects registration marks with color variants. Next-generation ARMS (Auto Registration Mark Sensor). Three-step adjustable pinch-roller pressure settings. Available Ethernet connection for sharing on networks. Highest cutting force in its class. 600gf maximum cutting force for cutting wider variety of materials. Fastest cutting speed in its class. 58.5 inches per second (1485mm/s) maximum cutting speed for higher productivity. The Optional flange set, new designed media basket and 3 different pressure push rollers provides more control on long length cutting for guaranteed 50 feet tracking. The series come in cutting width of 24, 30, 42, 54 and 64 to fit your requirements. When Using with Graphtec specified media and cutting condition. Cutting Plotter Controller Software enables remote control via a Pc. 3 inch LCD display with interactive operation panel. 1 - FlexiSIGN / Vinyl Express LXi Expert Software (Not a Trial Version). PC with 2.0 GHz Processor or better. 128 mb Video Card or better. USB 2.0 Ports (2 or more) and Serial COM Ports. Windows 7/8/10, 32 bit/64 bit. Vinyl Express LXi Expert is one of the most-popular brands of sign-making software in the world and sells for hundreds. LXi Expert is a complete text layout with powerful image scanning program that utilizes both Windows TrueType and Adobe Type 1 fonts. LXi Expert allows you to do simultaneous cutting and text designing of your signs. Don't be locked into a dead end software package with no upgrade path or a basic craft/hobby software. You can upgrade LXi Expert to the Master or Master Plus versions. Some reasons to use LXi Expert include. Design Central is your sign layout partner. Customize the interface to suit your work habits. Built-in spell check saves costly mistakes. Edit on-screen any effect applied to an object. Superior text and layout features. From the makers of FlexiSIGN software & FlexiSIGN compatible. Designer's Productivity Suite - SignPower Clipart, 24 in x 30 ft roll white EnduraMAX banner material, EnduraMAT 18 in x 24 in with SW logo, EnduraTEX Iron On 15 in x 5 ft - White, SignTracker 90 Day Trial Version Flyer, EnduraTex Iron On Instruction Sheet. 2 rolls of vinyl, R-Tape sample pack and 1 GOLD squeegee. Everyone needs supplies to run a business and we can help. These coupons do not work with any other web site. The item "30 Graphtec FC8600-75 Vinyl Cutter Plotter & Stand Decal Machine Bundle Kit" is in sale since Wednesday, December 14, 2016. This item is in the category "Business & Industrial\Printing & Graphic Arts\Plotters, Wide Format Printing\Cutters- Wide Format". The seller is "signwarehouse" and is located in Denison, Texas. This item can be shipped to United States.